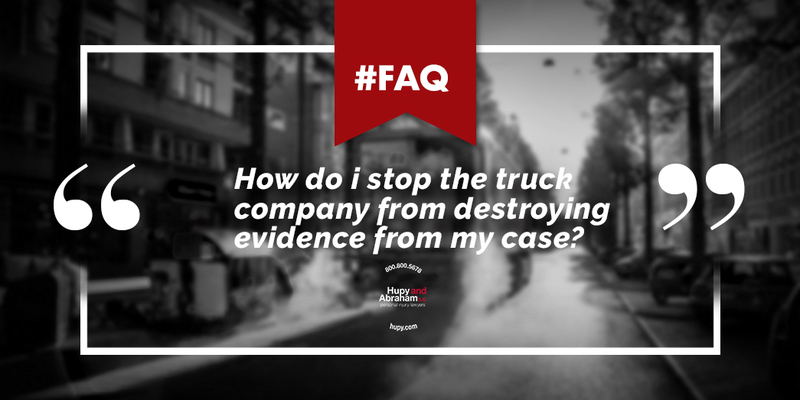 How to Protect Evidence the Trucking Company Has Obtained | Hupy and Abraham, S.C.
Can I do anything to stop the trucking company from destroying evidence that they have in their possession that might be important to my truck accident case? Yes. The trucking company likely has a lot of information that could be potentially relevant to your truck accident claim. If you take the right action quickly, then you may be able to prevent that evidence from being lost or destroyed. What Evidence Are We Talking About? The truck. The damage to the truck can provide valuable information about what happened in the accident. It’s important that any damage to the vehicles involved in the crash not be repaired. Driving logs. The hours the driver worked the day of and the week of the accident may be relevant. Electronic monitoring data. Anything about speed, time worked, and other data that is automatically recorded on the truck could be relevant. Cargo logs. The type of cargo, its weight, and how it is distributed on the truck could be relevant. Inspection reports. Truck inspection dates and results may be relevant to your claim. Maintenance logs. How and when the truck was maintained or fixed could be relevant to your claim. Alcohol and drug testing results. If the trucking company did any routine or unplanned alcohol or drug testing, or if they failed to do this kind of testing, it could be important to your claim. Other relevant information. Any other relevant information about the trucker, the trucking company’s procedures, or the accident could be important. Depending on the circumstances, some or all of this evidence could be relevant to your recovery. Our attorneys can send what is known as spoliation of evidence letter to the trucking company. This letter will request that all information that is potentially relevant to your claim be preserved. The consequences for destroying evidence once a spoliation letter has been sent can be significant. While there are sample spoliation letters available on the Internet, it is important that your letter be specifically tailored to your case and sent to the right parties. Our experienced truck accident lawyers draft and send appropriate letters on behalf of our truck accident clients. To schedule a free consultation and to learn more tips for successful truck accident cases, please contact us online or call us directly at 800.800.5678 today.